WARNING: Better Than 50-50 Chance of Cascadia Subduction Zone Eruption. Note: Due to current hazardous events, ECM has made available a 30% discount on our one-year membership. We have also made available 30 scholarships for those unable to afford our discounted price. New price $29.05. Those needing to apply for a scholarship send an email to mitch@earthchangesmedia.com and put “scholarship” in subject line. A group of geologists and seismologists have come forward with a dire analogy of the next major earthquake and tsunami – would occur on the US Northwest coastline. This area is known as the Cascadia Subduction Zone. 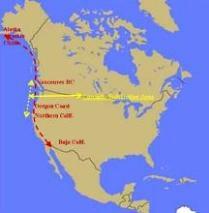 This is an ocean-bottom fault line which goes from Northern California – north to Vancouver, Canada. 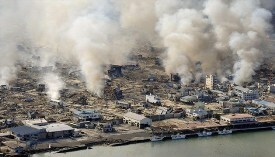 Already, geologists are stating Japans 8.9 quake is likely to be increased in magnitude. While Japan struggles to recover from one of the greatest earthquakes in world history, West Coast seismologists are warning that a quake just like it could occur at any time off the Washington and Oregon coasts. The last subduction quake off the West Coast, which occurred on Jan. 26, 1700, has been judged at between magnitude 8.7 and 9.2. The size of the 1700 earthquake was determined from evidence buried in sediments along the coast. 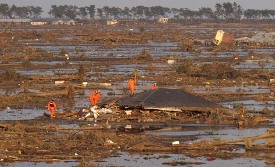 The date is known, because it created a tsunami that washed up in Japan, where observers recorded the date. Subduction earthquakes are caused by the slippage between two tectonic plates. Plates on opposite sides of the Pacific Ocean are different, but in either case, a tsunami would travel a short distance before hitting land. 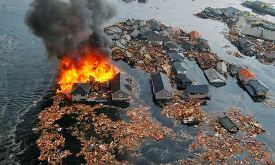 As in Japan, people living in Washington’s coastal communities might have less than half an hour to escape from a surge of water from a subduction earthquake. Read this with healthy skepticism: There are rumors which have been passed to me from people I tend to hold trustworthy – there are people aware of current scenarios and have chosen to vacate the Oregon-Washington coastlines. Please use your gift of discernment and never take one person’s opinion, truth, conjecture to heart. Always do your own research when it comes to serious and perhaps life-changing decisions. This entry was posted in 2012, ancient text, ancient_text, asteroids, astrology, astronomy, climatechange, comets, cycle 24, earth change, earth changes, earth’s core, earthchange, earthchanges, earthchangesmedia, earthquake, earthquakes, earth_changes, extreme weather, flood, floods, galactic center, galaxy, global warming, hopi prophecy, hopi_prophecy, hurricanes, lunar-eclipse, lunar_eclipse, mayan, mayan prophecy, mayan_prophecy, mitch battros, mitch_battros, pole shift, science, solar eclipse, solar storm, solar_eclipse, solar_flares, solar_system, space, space weather, sun-earth, sun-earth-connection, sunspots, sun_earth_connection, tsunami, Uncategorized, universe, volcanoes, weather and tagged 2012, ancient text, ancient wisdom, charged particles, coronal mass ejection, cycle 24, earth changes, earthchangesmedia, earthquakes, extreme weather, hopi prophecy, mayan prophecy, mitch battros, polar shift, pole shift, solar cycle 24, space, space weather, sunspot count, sunspots, tsunami, volcanoes. Bookmark the permalink.